Smartphones have predominantly been used to inform or influence purchases, but mobile commerce is on the rise, particularly among young shoppers. Roughly 70 percent of millennials used an app to buy something, representing an 85 percent increase over 2014. A majority of smartphone owners (56 percent) purchased a product using an app in 2015, according to a new survey from Verizon. For 23 percent of those, it was their first mobile purchase. 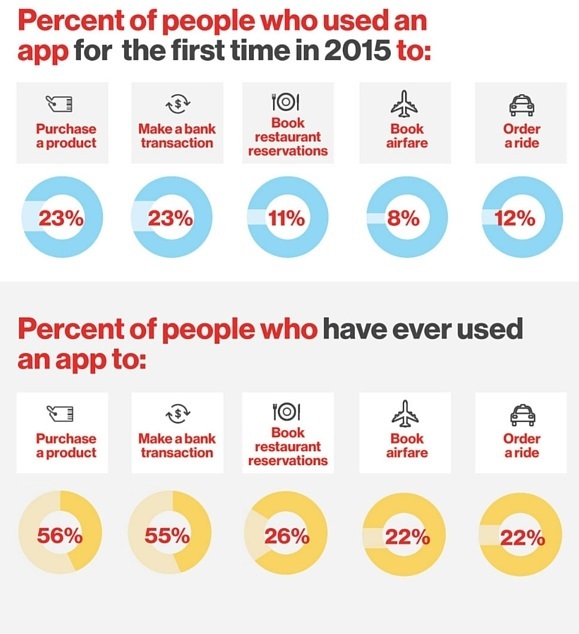 The survey also revealed rapid growth in consumers using apps to book rides, flights and restaurant reservations as well as perform banking transactions. By age group, 70 percent of millennials (18-34) made a product purchase using an app last year; close to 66 percent of Gen Xers and 39 percent of baby boomers did the same. And it's not just lower-ticket items or ride sharing—smartphone owners are using apps to make mobile bank transactions in rising numbers (23 percent did so for the first time in 2015), and a stunning 22 percent of U.S. smartphone owners have ever used an app to buy an airline flight.